Handling toxic was never so much fun before. This is your chance to save the world from complete contamination! Team members must work together and man oeuvre the highly toxic waste out of the radiation zone using the limited objects provided. But be warned not every object can help you! Neutralise the contaminated liquid within a limited time frame to win. 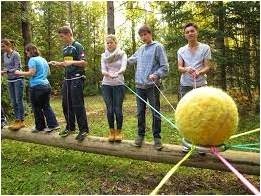 This fun filled activity is sure to test your nerves, as well as pushing decision making and communication skills to the max! This is a popular, engaging small group initiative activity which always "works", providing a rich teamwork challenge for about 30-45 minutes. Involves thinking, imagination, action, fantasy, risk and an attractive solution.